Before the wave of exploration and immigration to the New World, millions of Native Americans lived on the lands that would become settled by Europeans. 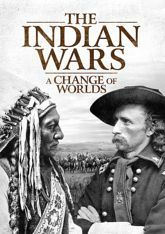 As disease ravaged the indigenous population and resources became scarce, a series of violent conflicts arose between tribes, settlers, and the government that scarred the continent. In this seven-part documentary series, take a journey back through history to the tragic battles -- from the first settlements to the last massacre as the United States stretched from the Atlantic to the Pacific.